The European Central Bank rate cut on Thursday is yet another bit of monetary policy loosening. The aim is not to make markets frothy – but that is the result. There may seem no catalyst for bubbles to burst. But the absence of fear is itself a warning. The latest upward phase in global markets started when the U.S. Federal Reserve unexpectedly did not reduce its bond purchases in September. The decision weakened the dollar against the euro, exacerbating deflationary pressures in the depressed zone. The ECB has now responded with what might be called a retaliatory rate cut, which has already brought the euro down a bit. For global markets, it all means that the policy taps are wide open. The Bank of Japan is increasing its monetary base at an annual pace of about 60-70 trillion yen ($611-$712 billion) – two-thirds of the Fed’s high speed, in a smaller economy. And emerging economy bank lending has contributed two-thirds of the $3 trillion, or 4.6 percent, rise in global M2 since January, according to JPMorgan. The bank’s economists judge the current episode of excess global liquidity the most extreme they have seen. Signs of excess abound. Stocks wobbled after the ECB cut and firmer U.S GDP, but the MSCI world equity index is still close to five year highs. The yield on U.S. 10-year Treasuries, which touched 3 percent early in September, has fallen back to 2.6 percent. Robert Shiller, the Nobel prize-winning economist, warns of bubbly property prices from Brazil to China and the eponymous S&P/Case-Shiller index shows home prices in 20 large U.S. metro areas up by 12.8 percent from August 2012. It looks like dangerous calm. Trading volume in the U.S. Vix S&P 500 options volatility index, often seen as a gauge of fear, has slumped. The Vix did jump on Nov.7, but from unusually low levels. Amid the glut of liquidity, fear has gone. That is itself a warning. Any change in monetary policy expectations could throw sand in the market’s well-lubricated complacency. U.S. growth was better than expected. The Fed surprised in September. It could surprise again. 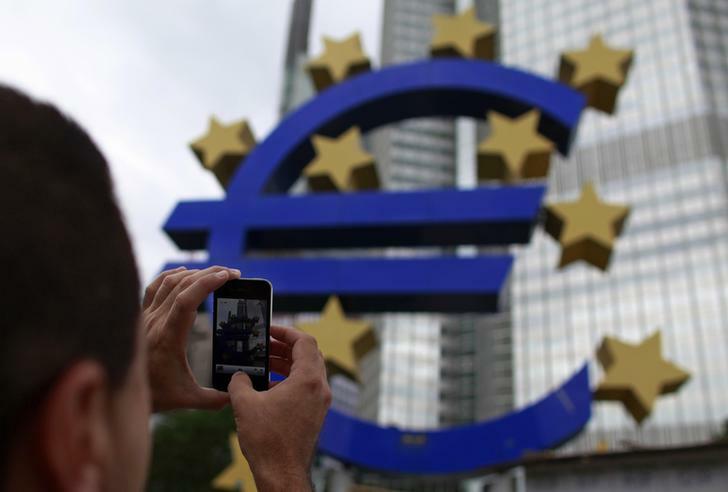 A man takes a picture with a mobile phone of the euro sign at the European Central Bank (ECB) headquarters in Frankfurt. The euro fell to as low as $1.339 against the U.S. dollar in early trading on Nov. 8 after the European Central Bank’s surprise rate cut on Nov. 7. European shares opened lower after weak earnings saw the U.S. Dow Jones Index slide by 1.0 percent and the Standard & Poor’s 500 Index by 1.3 percent on Nov. 7.